Flood-lit Go Karting - till 10pm. Go Karting at night with a burger to follow! A good laugh, Swiss-run, pretty well managed track and cheap and cheerful bar food. Since a few month they added also an Off-Road Race Track where you can hire and drive with beach buggies. Really cool! 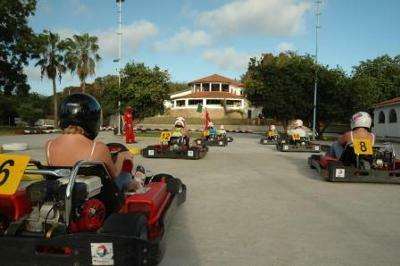 Mombasa Go-Kart is the best family place at the coast. Beside racing there is also lots of other entertainment: Video-Games, a big garden with lots of animals, a real bulldozer(excavator) for hire for kids, a playground ... and a ample bar for the parents with direct view on all. I didn't expect such an organised place in Africa being the first time to Africa! big ups Kenya! Choose the one hour program, it is best value for money.